Confession: as someone who's been in the B2B content marketing space for a few years now, I've been completely geeking out about the speaker lineup for The Uberflip Experience. Jay Baer, Joanna Wiebe, and Lee Odden all in one room speaking about marketing stuff? It can't be real... but it is. And it's happening on August 24-25 in Toronto! So, what exactly will you learn from these marketing mavens at UFX? Here's a breakdown of some the sessions you can look forward to. Jay Baer is the founder of Convince & Convert. He's a renowned business strategist, keynote speaker, and the New York Times best-selling author of five books who travels the world helping businesspeople get and keep more customers. Haters aren’t your problem… ignoring them is. In this eye-opening and hilarious presentation, Jay Baer reveals brand-new, proprietary research into why and where your customers complain. If it feels like there are more complaints than ever, and that you’re spending more time and money dealing with negativity and backlash, you’re right. But the rise of customer complaints is actually an enormous opportunity. Learn more about Jay Baer's session at UFX. Andy Crestodina is a co-founder of Orbit Media, an award-winning, 35-person web design company in Chicago. Over the past 15 years, Andy has provided web strategy and marketing advice to more than 1000 businesses. You’ve been blogging for years, but traffic growth is slow and leads are flat. But your analytics are telling you what to do next. Here’s how to listen. This session covers blog optimization for experienced bloggers, including the tactics for traffic and conversions using social media, email marketing, and search optimization. Learn specific actions using analytics and research to improve lead generation. Learn more about Andy Crestodina's session at UFX. Lee Odden is co-founder and CEO of TopRank Marketing, a Minneapolis based digital marketing agency. Lee is also the author of Optimize, published by Wiley, and editor of MarketingBlog.com, the only blog ranked #1 three times by Content Marketing Institute. Cited by The Economist, The Wall Street Journal and Forbes for his expertise, Lee has evangelized an integrated approach to marketing through over 150 presentations in 13 countries. Word of mouth is still the most powerful form of advertising and recommendations from friends, peers and experts hold valuable influence in the mind of business buyers. Losing business to content overload, disappearing organic social visibility and the effects of ad blocking, B2B marketers are looking for better ways to attract, engage and convert new business. This presentation from Lee Odden of TopRank Marketing will provide the strategy, tools, and tactics for developing an integrated influencer content program that will put points on your ROI scoreboard. Learn more about Lee Odden's session at UFX. Is Your Marketing Strategy Ready for the Wild, Wild West? Lauren Goldstein is the VP of Strategy & Partnerships at Babcock & Jenkins. While Lauren’s motto is: “Nothing great was ever achieved without enthusiasm." That motto is closely followed by a whole lot of determination. As a marathon runner, Lauren understands what it means to set a long-term goal and work every day to achieve it. This includes feeding her inner geek by defining demand generation strategies for clients, which she has been doing since 1996. Apps are the new ads. Email fatigue is on the rise. Instagram adoption is outpacing Facebook. How do you make sense of it all and execute marketing strategies that drive results and align with your company’s overall business goals? With proven insights born from BNJ’s work with top Fortune 500 companies, we’ll provide smart ways to corral buyer insights, clarity and cross-functional alignment needed to create and execute engaging, measurable marketing strategies tuned for today’s B2B marketing landscape. Learn more about Lauren Goldstein's session at UFX. Anela Chan is the Lead Data Scientist at Contently, a content marketing technology solution. A data scientist with both engineering and storytelling leanings, she creates algorithms to help many of the world’s most recognizable brands do effective content marketing. In the early days of content marketing it was enough to publish a few articles and see how things went. The strategy? Throw more spaghetti on the wall to see what sticks. Those days are long gone. Not only are content marketers expected to prove return on investment of every dollar and more, they’re expected to make data-driven decisions upfront to drive business results. Enter data science. Anela Chan, lead data scientist at Contently, creates algorithms to help many of the world’s most recognizable brands do effective content marketing. She uses big data to analyze what brands are doing, what’s working, and what isn’t. In this talk she’ll look at content marketing trends in each step of the publishing process through proprietary data that explains why some brands are captivating audiences while others can’t seem to get the spaghetti to stick. Learn more about Anela Chan's session at UFX. The creator of Copy Hackers and co-founder of Airstory, Joanna Wiebe teaches businesses to convert more using just their words. She's been invited to talk copy and content on such stages as Inbound and Mozcon – and, of course, Uberflip. Great content strategy! Nice work – you really strategized the hell outta that content. Now you've got the tiny little task of, y'know, filling the page. Repeatedly. And making people care about the stuff your team is casually calling “content”. In this talk, Joanna Wiebe shares her from-the-trenches stories of writing content that matters at Copy Hackers and with clients like Bounce Exchange. Learn more about Joanna Wiebe's session at UFX. Kyle Lacy is Head of Marketing for OpenView, a venture capital firm based in Boston. His team focuses on everything from managing a community of over 100,000 software professionals and branding to events and content marketing. He is also the author of three books, Twitter Marketing for Dummies, Social CRM for Dummies, and Branding Yourself. Trends like scalability, artificial intelligence, distribution, and mobility are changing the way we buy, sell and communicate. We must be poised to take advantage of these changes and equipped to handle a customer’s journey that is changing constantly. In a world of instant communication, the most successful will be those that embrace experiences over marketing. Join us as we talk about why we are not the CEO or VP of sales, the head of marketing or the customer support manager, we are experience makers and managers. The only thing that makes us relevant are the experiences we provide. Everything else is just noise. Learn more about Kyle Lacy's session at UFX. Pat Spenner is the Strategic Initiatives Leader for CEB’s Marketing practice, spending his time on research, new product development, and thought leadership. He is a co-author of The Challenger Customer, contributes to Harvard Business Review, and is a regular blogger for Forbes. CEB research reveals that more — and more diverse — customer stakeholders are involved in B2B purchases today. All those cooks in the customer kitchen are killing MQL conversion, stalling deals and firmly anchoring the customer in status quo land (“I think we’re ok for now. Call us in 6 months.”) Why? Because customer buying groups can’t arrive at consensus on the solution they need, or often even the problem they have to begin with! Here’s the rub: personalization (as typically done by B2B marketers) makes the consensus problem even worse. But there’s a way out of this trap, if you know the hidden influencers to target, and how to engage and equip them to build the consensus you need to unstick the status quo. Pat will share findings from CEB’s work and book, The Challenger Customer, along with real-world content examples. Learn more about Pat Spenner's session at UFX. Dayna Rothman is Senior Director of Marketing at EverString, the fastest growing predictive marketing software company. Prior to EverString Dayna led content marketing at Marketo. She is the author of Lead Generation for Dummies and has authored numerous Lynda.com/LinkedIn courses including Content Marketing Fundamentals, Advanced Lead Generation, and Blogging for Business. Account-based marketing (ABM) is all the rage right now – and for good reason. A well-executed ABM strategy can increase pipeline velocity and close bigger deals, faster. However, ABM strategies require the coordination of a number of moving parts (especially when leveraging content). In this session, Dayna Rothman, Senior Director of Brand, Content & Demand Gen at EverString and author of Lead Generation for Dummies, will provide actionable tips and tricks for how to prioritize your ABM efforts and build an account-based content strategy. Learn more about Dayna Rothman's session at UFX.Learn more about Anela Chan's session at UFX. highly prestigious Canada's Top 40 Under 40. We live in a culture of change. Most brands are overwhelmed by the massive shifts they have to make to their business models. Disruption is everywhere. Digital transformation is imperative. We live in the Uber-ization of everything. There are several new (and dramatic) realities that will force businesses to rethink many of their commonly held beliefs about what works in business today, and what the future may look like. Interestingly, this is less about the evolution of technology and much more about how consumers have become that much more efficient in this very different landscape. Bring an open mind, because the world continues to change and challenge brands like never before. The new leadership is being a digital leader. In this exciting presentation, Mitch Joel reveals what this means for the future of B2B brands. Learn more about Mitch Joel's session at UFX. Trained at Toronto’s legendary Second City, Ron was named one of the “Top 10 Creative Canadians” by Marketing Magazine. He’s been an award-winning advertising Writer and Creative Director for some of the world’s most respected brands including Air France, Evian, Microsoft, Volvo, and many others. His advertising work has been recognized by The London International Advertising Awards, The New York Festivals of Advertising, The Crystals, The Extras, The Canadian Marketing Association, The Advertising & Design Club of Canada, and The Marketing Awards, to name just a few. Low production costs, easy distribution and suddenly, everyone’s a creator. Consumers can now fill their day with content dedicated to their hobbies, passions and the things that interest them most. For business, that’s a problem. See, consumers used to vote with their wallets. Now they vote with their time. And you know who’s winning the battle for time? Other consumers. Yup. Right now, your customers are more creative than you are. They’re more innovative than you are. They’re more authentic than you are. Often, They’re even more helpful than you are. In the battle for time, your competition isn’t the category leader. It’s the Internet. It doesn’t matter if you’re selling a product, pitching a new idea or trying to get a raise, your biggest challenge is someone willingly giving you the time to do it. This humorous and insightful presentation highlights how organizations, and the individuals within them, win the battle for time. Learn more about Ron Tite's session at UFX. 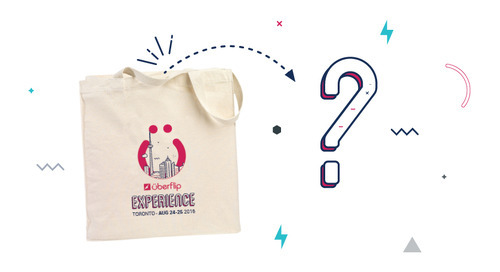 Don't miss any of these sessions – get your ticket to The Uberflip Experience now! These tools will make your job as a marketer THAT much easier.